With balm of rock and sea. When he has pierced the screen, and holds the further clue. Faint caught where Cumbria looms a geographic ghost. If budding larches feed the hunger of his sight. If silver plates the birch, gold rustles in the sheaf. If God with trenchant forms the insolent lushness quells. Unto all mortal homes refused the other side. Each human sign and pledge that feeds him with delight. How from Slieu-whallian moans the murdered witches’ wail. As booms the herald gun, and westward wakes the hills. And guide his straining bark to refuge of the land. Avert the settled aim, or daunt the keen emprise. And all the prosperous fraud that binds their social frame. Usurp the clumsy helm—if England sink or swim! And stand outside these nations and their noise. 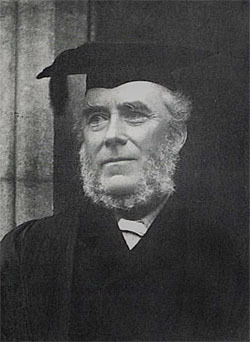 Thomas Edward Brown's father was a vicar and from the age of two the family lived at Kirk Braddan Vicarage. Although the title of the poem refers to the Vicarage, it is more about the Isle of Man in general.